Do you make brushing your teeth part of your daily routine? Can you imagine going to your annual visit to the dentist having done nothing to care for your teeth in the year since your last professional cleaning? “There is nothing so successful in removing plaque as consistent brushing and yearly professional cleanings,” advises Dr. Katherine Kling of the University of Illinois. 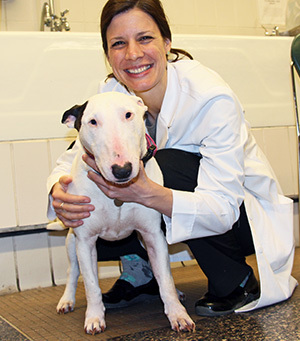 Dr. Katherine Kling, a veterinarian at the University of Illinois Veterinary Teaching Hospital in Urbana, says that we should be thinking of our pets’ teeth in a similar way we think of our own teeth and that tooth brushing is the best way to prevent not only bad breath and gum disease but also potentially serious infections in our pets’ mouths. “Just as we can’t expect mouthwashes or healthy, crunchy food to remove all of the plaque from under our own gum lines, similarly there is nothing so successful in removing plaque as consistent brushing and yearly professional cleanings for cats and dogs,” she says. February is National Pet Dental Health Month and a perfect time to start regular brushing sessions with your furry friend. There are many toothpastes and toothbrushes available at pet stores. Pick ones appropriate for your pet. As for the toothbrush, Dr. Kling recommends products approved by the Veterinary Oral Health Council (see VOHC.org). “It is also safe to use a soft-bristled toothbrush approved by the American Dental Association, such as a toothbrush made for children,” says Dr. Kling. But do you have to brush your pet’s teeth every day? While missing the occasional day is fine, brushing infrequently may not be helping your pet. Dr. Kling says studies suggest that brushing daily or every other day helps reduce plaque accumulation, while brushing weekly or less frequently is less beneficial. What about other products available for dental care in cats and dogs? These products should not be relied upon as the only source of dental care or as a replacement for brushing. In fact, certain toys should be avoided in order to prevent trauma to your pet’s teeth. “Many of the dogs that we see with fractured teeth have sustained the fracture while chewing Nylabones or toys made of a similar material, antlers, bones, or hooves,” warns Dr. Kling. When in doubt, check the VOHC.org website for approved products. What if your pet is not used to having its teeth brushed and doesn’t like it? “If you are considering beginning to brush, but have not had a recent cleaning, it may be safest to start by letting your pet lick toothpaste from the toothbrush. This way, your pet develops a positive association with tooth brushing. Then, begin a regular regimen of brushing following a professional dental cleaning,” Dr. Kling recommends. 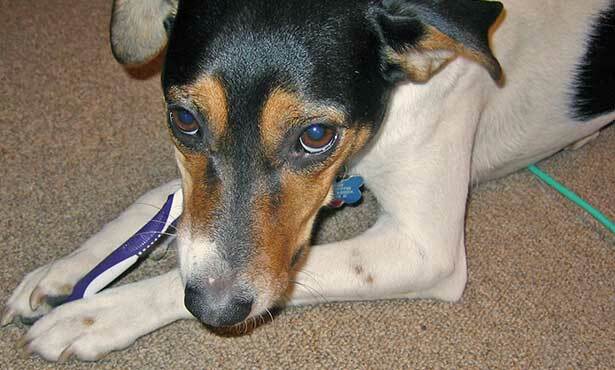 In some cases, consistent tooth brushing is not a workable option for certain pets and owners. “Yearly professional cleanings are still going to help in these situations. Water additives, gels, and treats may help as well. The products most likely to help slow the progression of gum disease are those with the VOHC seal,” says Dr. Kling. If you have any questions about your pet’s dental care or dental products, contact your local veterinarian for more information. Top photo: “Sadie&toothbrush1” by Linda N.